TC 7 and TC 1 Now Available! 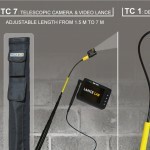 Following the success of the XL 8 and Mini-Flex, the Lance Lab team is proud to announce the arrival of the TC 7 and TC 1 series for video surveying. Check out our online purchases page for further details!